Why service definitions are so useful and how they play a key role in YaSM service management. The idea of defining services is not new: In fact, we find it in every service management framework and standard. ITIL® and ISO 20000, for example, relate to service level agreements or SLAs as the documents where the services are defined. So it will not surprise you that in YaSM we also have a strong emphasis on defining the properties of our services and setting up formal agreements with our customers. This video is the second one in our series about "the simple principles of good service management - and how to apply them in practice". There have always been a number of time-tested, simple principles in service management that we must get right in order to become successful providers of services, and in our video series we want to show you how you can bring these principles to bear in your organization. Part 1: The customer is king. - Customer service management in YaSM. Part 2: Vaguely defined services can't be managed. - Service definitions and service design (on this page). To learn more about YaSM's service design process or service definitions and agreements, please visit the free YaSM Wiki. In our second video about the simple principles of good service management we discuss the importance of defining our services. The idea of defining services is of course not new: In fact, we find it in every service management framework and standard. ITIL® and ISO 20000, for example, relate to service level agreements or SLAs as the documents where the services are defined. So it will not surprise you that in YaSM we also have a strong emphasis on defining the properties of our services and setting up formal agreements with our customers! And today I'd like to tell you more about why service definitions are so useful and how they play a key role in YaSM. There are lots of different types of restaurants; some serve, say, basic fare at a modest price, while others specialize in refined, more expensive French cuisine. Without a menu, things are almost certain to go wrong: Depending on what they expect, customers may complain about high prices or poor quality. So restaurants always have kind of a service definition in the form of a menu that lists the food on offer and its price. Customers thus know what to expect and, if their expectations are met, there's a good chance that the customers are happy and come again! There's an inexpensive standard service, allowing customers to send in blood samples through the post, without any guaranteed processing times. For customers who need the test results urgently, there's a more expensive express service: The laboratory collects the blood samples from the customers and delivers the test results within 4 hours. Just as in the case of the restaurant, we must define somewhere what the customers get for their money, and in YaSM we use two documents for this purpose: Service definitions in combination with service agreements or contracts. The price customers have to pay for using the service. Now, why is the service definition so important? Because, with a clear definition of the service, your customers know what to expect and how much it will cost, and you know what kind of service you have to deliver. This puts you in a position to figure out what capabilities and resources you need for providing the service. At this point you might say that this is not exactly new and we are only stating the obvious here! Well, I agree that all service providers should define their services in this way, but time and again we experience that many organizations have some kind of idea of what services they provide, but in fact they never thought about their service definitions properly. That the blood samples are collected. That the results are available within a guaranteed time frame and in a specific format. Or that the invoice is sent directly to their health insurance. These are just examples, but I hope you can see that, when creating the service definitions, we put ourselves in the shoes of the customers, and this is often a very good exercise that helps us offering better, more attractive services. So we have now seen that proper service definitions are a key to success, and therefore they figure prominently in all service management frameworks. 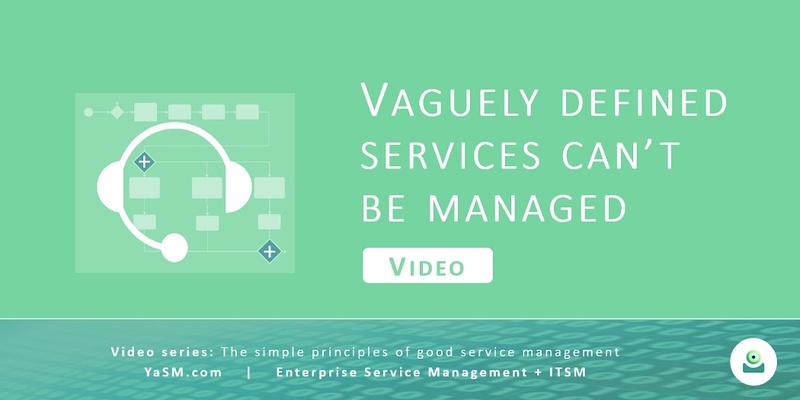 You may have seen in some other YaSM videos that YaSM contains five service lifecycle processes, one for setting the service strategy, and four more for designing, implementing, operating and improving the services. When taking a strategic decision to introduce a new service, then we'll create, as a first step, a draft service definition. The service definition will be completed during the service design stage, based, for example, on detailed requirements collected from the customers. The completed service definitions are then passed along to the service implementation process, so that we can implement the services as specified, and also to the service operation and improvement processes, where they serve as points of reference. Of course, the completed service definitions are also added to the service portfolio, which holds the complete collection of service definitions in our organization. Finally, in the service improvement process we may decide that a service needs an update, which could result in an updated service definition. And then the service lifecycle starts over again. I don't know if this looks complicated to you. In fact, I would say this is a rather straightforward way of managing the services of an organization based on service definitions, ... and in the YaSM® Process Map we provide detailed advice regarding these processes. At the left, where we have the inputs to this process, we can see the draft service definition being sent in from the strategic process. And define the capacity, performance and availability targets. After some more steps, we end up with a detailed service definition as a key output from this process (still in draft status, because it's not yet approved). Of course, since the service definitions are such important documents in YaSM, we also provide a ready-to-use template or checklist. You can open the checklist with a mouse-click and, as you can see, the template for the service definition is provided as a Word™ document that describes the typical contents. For instance, there are sections specifying the service utility (the outcomes of the service) and the service warranty. With this template it should not be too hard for you to create the service definitions in your organization. If we go back to Visio® again we can also see that the service definition, as a key output from this process, is passed along to a number of subsequent processes, for instance to the process for building new or changed services, where we need the definition in order to implement the service as specified. So much about service definitions and why they are so important in service management. I'm sorry this session took a bit longer than usual, but I suppose that, if in doubt and if possible, we should choose quality over speed. So I'd like to thank you for holding out until the end, and, as always, if you have any questions we are happy to answer them in the YaSM community!